If someone asks you what your archetype is, don’t worry—it’s not a cheesy pickup line. Archetypes are an ideal model of a type or group, like a personality type or a typecast character. Think of Darth Vader as the archetypal Bad Guy, or Dorothy Gale as the archetypal Innocent. Archetypal images represent fundamental human desires. In literature and art, they connect with readers and viewers at deep emotional levels. Why Use Archetypes in Marketing? Archetypes are a powerful marketing tool for your company. They help define who you are and what you stand for, and they help you connect with your customers on a visceral level. Customers feel like they know you, because you represent an ideal that everyone knows and understands. Hey, Baby, What’s Your Archetype? Psychologist Carl Jung identified 12 archetypes. Which one are you? 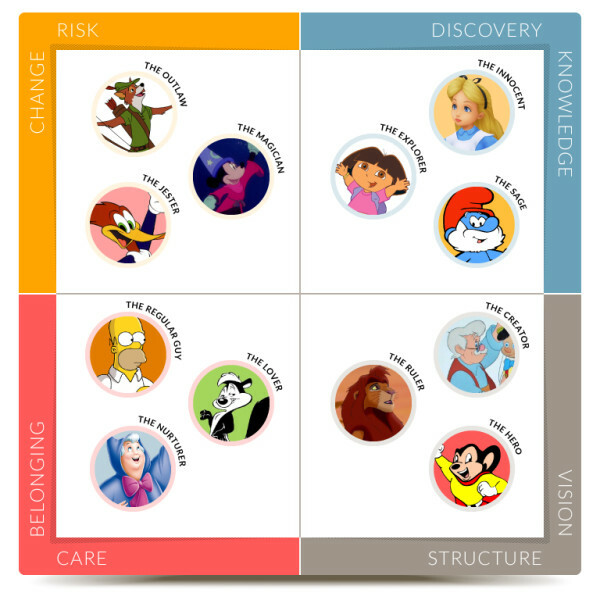 Now that you know who you are, how will you use your archetype in your marketing? Content is the most foundational part of incorporating archetypes into your marketing. From web copy to blogging to social media and printed collateral, everything you say should align with your archetype. If you’re the Magician, you’re always the Magician—otherwise, your brand becomes schizophrenic. And that’s one archetype you DON’T want to be! Your archetype should be reflected in your visual design as well. Elements like color, typeface, images and layout help communicate your archetype. Harley Davidson has embraced the Outlaw archetype, and it’s powerfully reflected in their design choices. No kittens or pastels on their website! Instead, they make heavy use of slick images and black tones. Font choices reflect a rebel personality. Images include bikes with flames or tattooed riders wearing denim and leather. Compare that with Coca-Cola, the Innocent. Coca-Cola uses bright colors and typefaces that communicate the idea of being fun-loving and carefree. There’s an airy feel on their website. They use fun icons and lively animations. Social media widgets are all over the place. When we start a project with a new client, we give them a questionnaire to determine what their archetype is. Each person on their team answers the questions individually, and we collect all their responses. It’s always fascinating to see how well aligned their own team is and whether they share the same perspective of their brand. Often they’re pretty close—sometimes, they have wildly different responses, and we help them through the process of getting on the same page. We also want to understand who our client’s competitors are, to see what the landscape looks like. Does our client stand out from the crowd? Are there any archetypal changes we need to make? If everyone in the security industry is competing as the Hero, maybe our client would stand out better as the Magician. While the archetype points out who you are as an organization, sometimes it makes sense to portray a different archetype in your marketing.